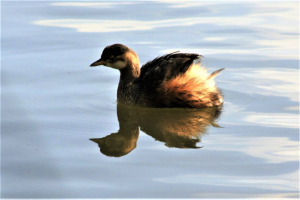 The two small grebes found in South Australia are an interesting example of two similar species using different habitat types to reduce competition. The Australasian Grebe prefers small freshwater bodies, feeds mainly on fish, keeps close to the shore and seldom forms large flocks. The Hoary-headed Grebe tolerates both fresh and brackish waters, likes large bodies of water and spends much time in the middle where it feeds mainly on invertebrates. It often gathers in large flocks. The Australasian Grebe feeds mainly on fish which it pursues underwater after diving, or by surface chases. It will also take freshwater molluscs and snails, aquatic insects and crustaceans. It tends to keep close to the shore rather than venturing into the middle of the water. The sexes are alike except the males are larger and longer billed. In breeding plumage, the head and neck are dark brown-grey, glossy black on the head with a crescent-shaped dark chestnut patch from above the ear coverts to the sides of the middle neck. The iris is golden and there is a pear-shaped yellow patch of bare skin at the gape. The upperparts and upperwing coverts are a dark brown-grey. The remiges form a large white panel with dark tips to the primaries. The underwings are pale grey except for the white panel formed by the remiges. The sides and flank are tawny, often rusty-tinged, and the fluffy rearmost underparts near the tail are a rather dull whitish bluff. The bill is black with a whitish tip and the legs are dark greenish-grey, yellowish grey on the inner tarsi. In non-breeding plumage the cap is dark brownish-grey extending to the level of the eyes. It contrasts with the off-white to pale-tawny face, chin and throat. The rest of the body is the same as in breeding plumage. Juveniles are like non-breeding adults but for a while retain the striped head and neck of the chick. The chicks have dark brown down with pale stripes on upperparts, and white and grey-brown underparts. There is narrow white supercilium over the eye. 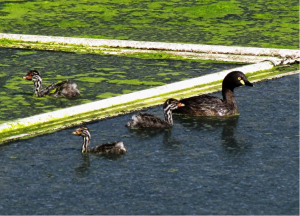 Australasian Grebes are moderately common throughout South Australia in suitable habitats. 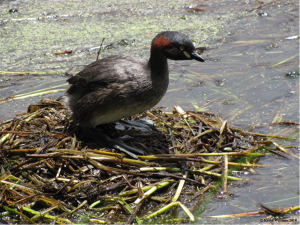 Australasian Grebes prefer smaller freshwater waterbodies with vegetated shores, particularly when breeding. They are possibly resident in the wetter parts of the state, but dispersive in the drier interior, moving to the coast in dry years. Only the nominate subspecies is found in South (Tachybaptus n. novaehollandiae– Stephens, 1826).